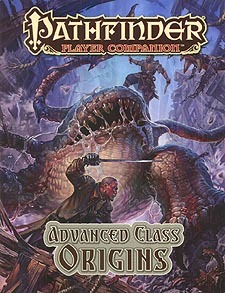 Unlock your character's potential and become a master of the hybrid classes with Pathfinder Player Companion: Advanced Class Origins! Featuring never-before-seen rules options for the 10 new classes from the Pathfinder RPG Advanced Class Guide, this volume is the ultimate companion for bringing your hybrid class adventurer into the Pathfinder campaign setting. Whether your character is one of Geb's enigmatic Twilight Saga arcanists, an investigator trained at Lepidstadt Academy in gothic Ustalav, or a scimitar-wielding swashbuckler dervish from Qadira, Advanced Class Origins makes sure her connection to Golarion is as powerful as her unique new skills and abilities. New traits to represent skills your adventurer acquired from locales such as the demon-plagued Tanglebriar, war-torn Nirmathas, and the deep fastness of the Mwangi Jungle.